Gold Claddagh necklace features a genuine mini Claddagh ring that is enhanced with a white gold and diamond accented heart. 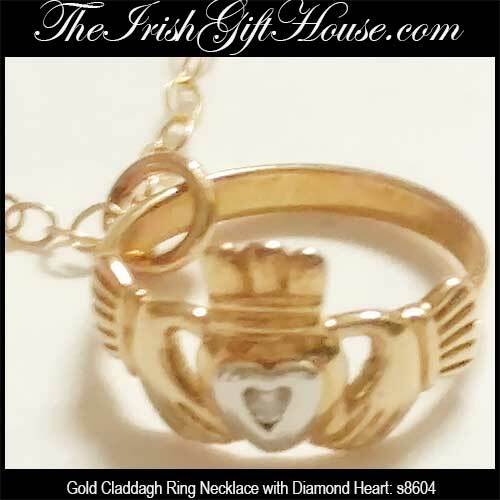 This Claddagh necklace features a diamond heart Claddagh ring on an 18" long 14K gold chain. The Claddagh ring necklace measures 1/2” wide x 1/4" tall, from the bottom of the white gold accented heart to the top of the crown. 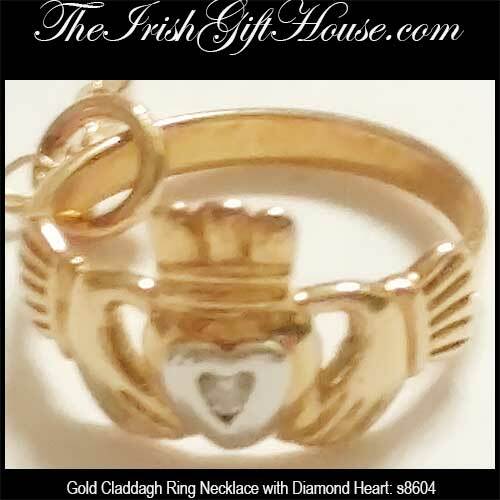 This 14K gold Irish pendant is made by Solvar Jewelry in Dublin, Ireland and it is gift boxed with a Claddagh history card, complements of The Irish Gift House.